I'm a rather free-form creator. Exact perfection is not my forte. 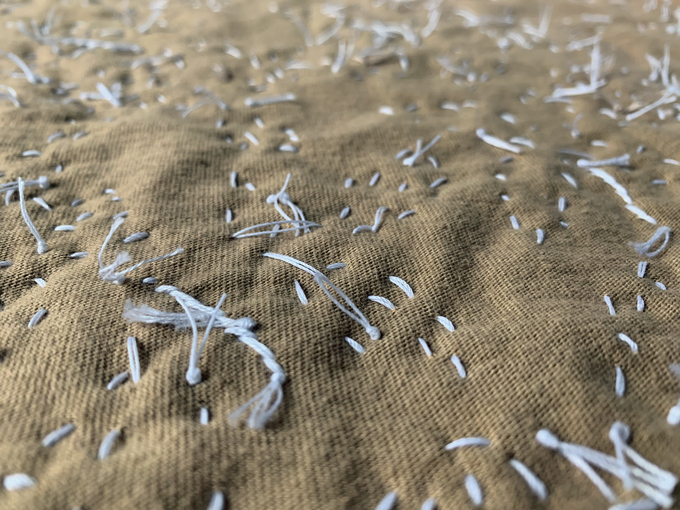 Most of the time when I hand stitch a garment I leave the end of my thread, the "tails", free to wag around on the back side of the fabric, or even let them become a design element on the front of the garment for the whole world to see. 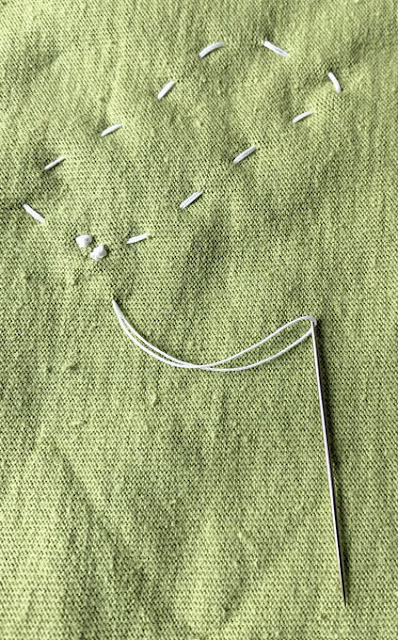 The feel or visual aspect of tiny knots and threads usually do not bother me in the slightest. 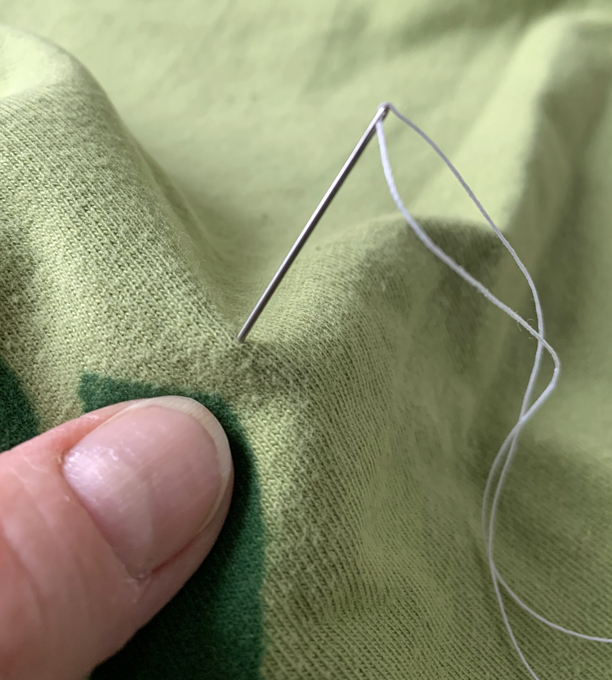 There are a few scenarios where I do like to keep things tidy and hide the tail of the end of the thread, for example, around the neckline or armpit area, or if it's a particularly precious garment and I want the backside to be as perfect as possible. If you have wanted to tidy up your sewing and would like to know how I do it, here is a tutorial on how to hide your tails at the starting and ending points of your stitching. 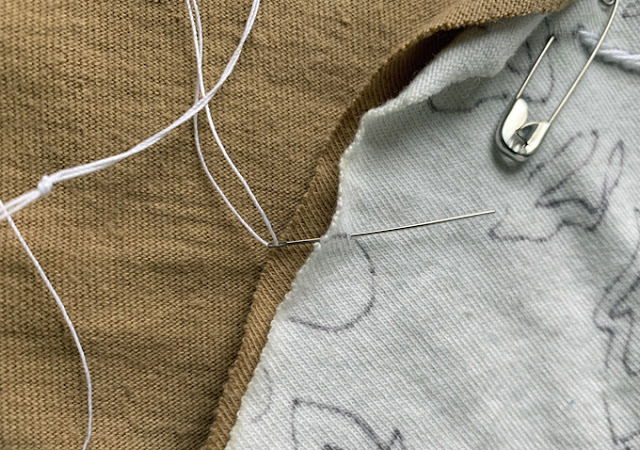 The easiest way to hide the tail is to feed your threaded and knotted needle between the two layers of fabric, bring your needle up at your starting point, and stitch as usual. 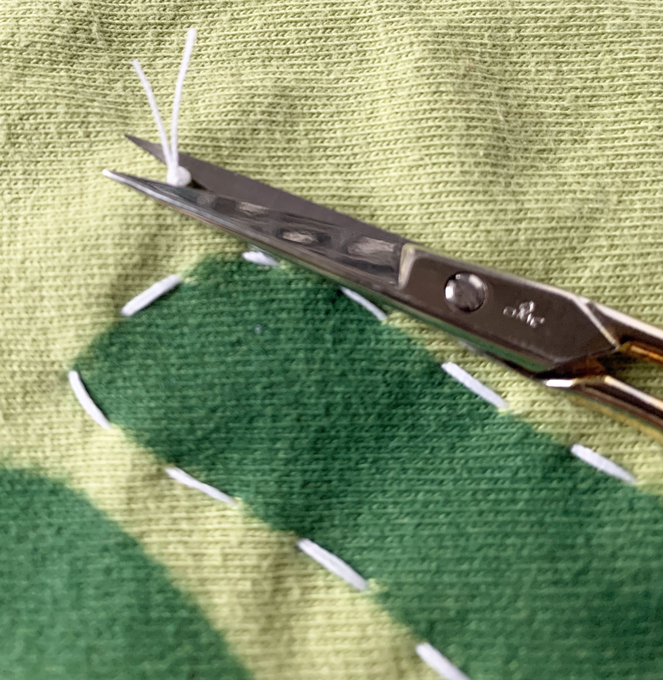 This oftentimes is not an option, for example, if you're working in an area of your piece where you cannot split the two layers of fabric. If that's the case, here is another way to hide your tails. 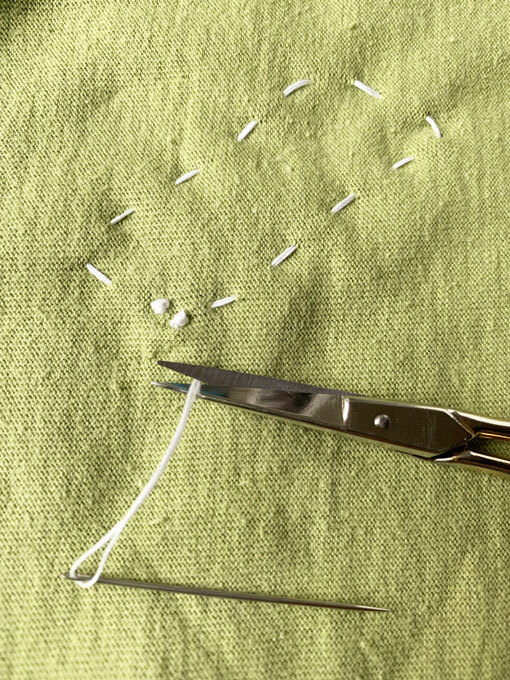 1: Make a knot (one that you will cut away later). 3: Run your thread through (between) your two layers of fabric, and come out with your needle and thread approximately at your stencil line on the back side of your fabric. 4: Tie another knot. 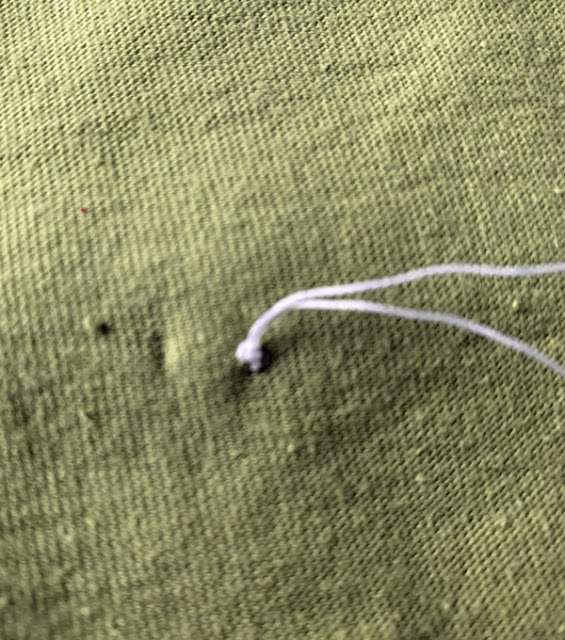 Now you have a knot on the top side, your 1/2 inch tail of thread between your two layers of cloth, and a knot on the back side (with the thread and needle), ready to begin sewing. 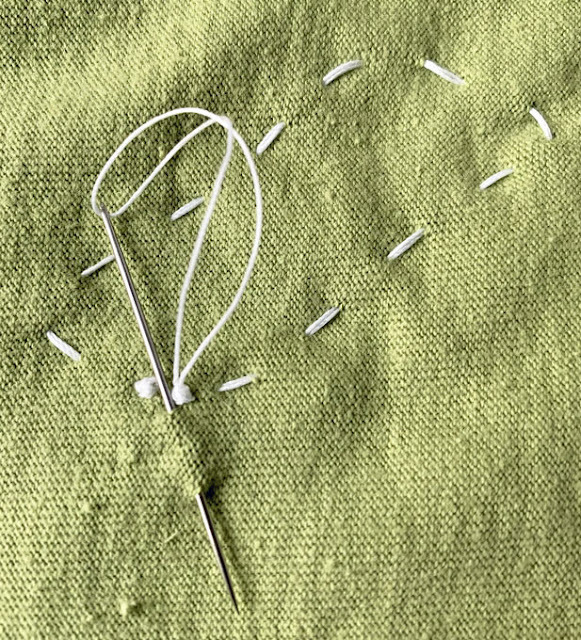 5: Bring your needle up to the right side of your fabric and begin to sew as usual. 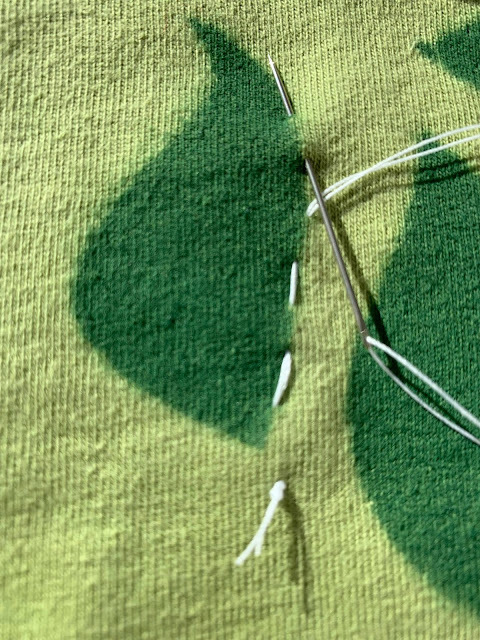 6: Once you finish your stenciled piece, knot off and run your needle through (between) your two layers of fabric. 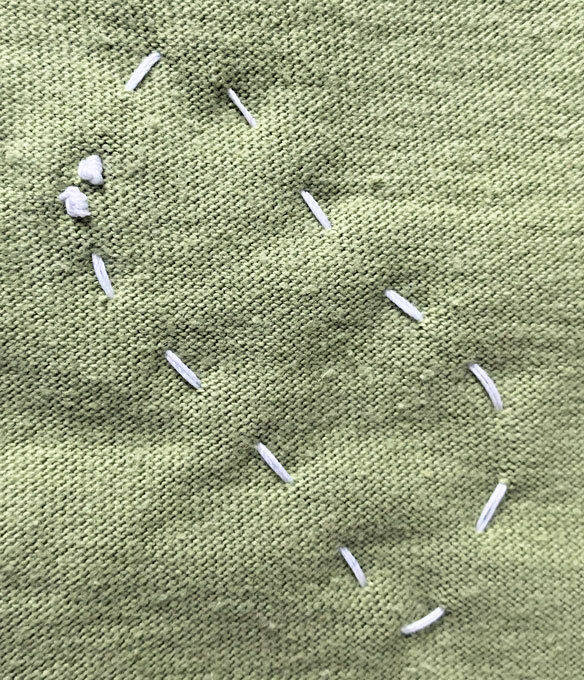 Come out about 1/2 inch away from your stenciled area if you are doing reverse applique or come out about 1/2 inch inside your stenciled area if you are doing negative reverse applique. 7: Turn your fabric over to the right side, and cut away your original knot. 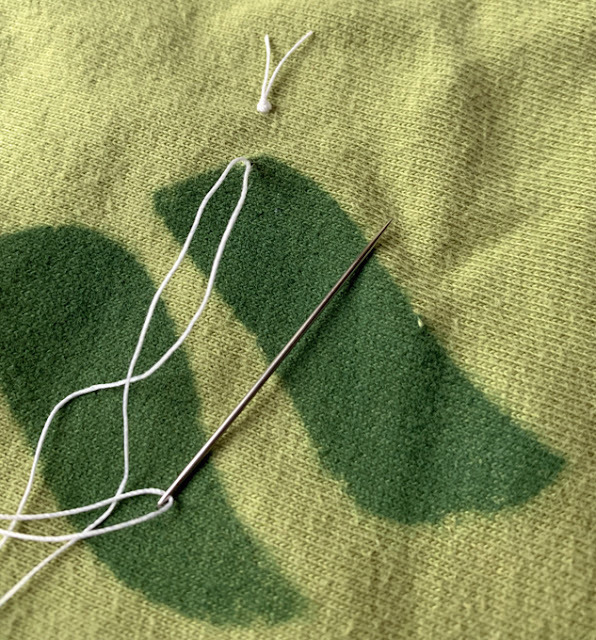 When doing the reverse applique, be very careful to thread your tail away from where your stencil, the paint is so the tail will not show when you cut away your stenciled area. You don't want this to happen. See the little tail hanging out at the top of the photo? 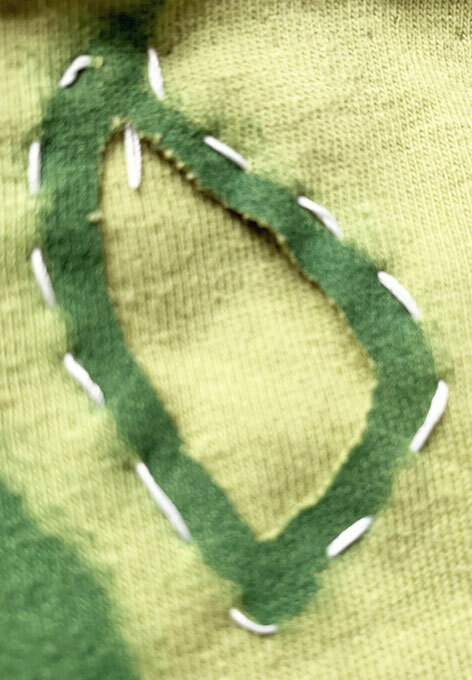 If you are doing the negative reverse applique technique, you will run your thread below the painted, stenciled area, as this will not be cut away and will hide that tail. I hope this helps you keep your tails hidden and your work tidy! Thank you for the clear instructions and great photos. I’ve never tried this before but now I think I’ll give it a go. 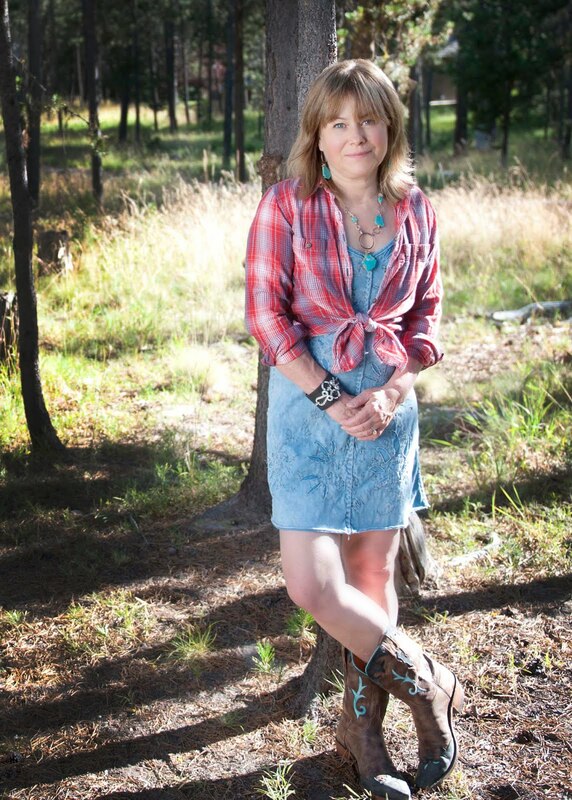 Hi Sue~ You're so welcome. Please let me know how it goes when you give it a try. If I need to tweak any detail to make it clearer, I'd love to know. Hi Elsie ~ You're welcome. I hope the new year is treating you well!